In the spirit of Women’s History Month we’ll be highlighting the women in our collection. 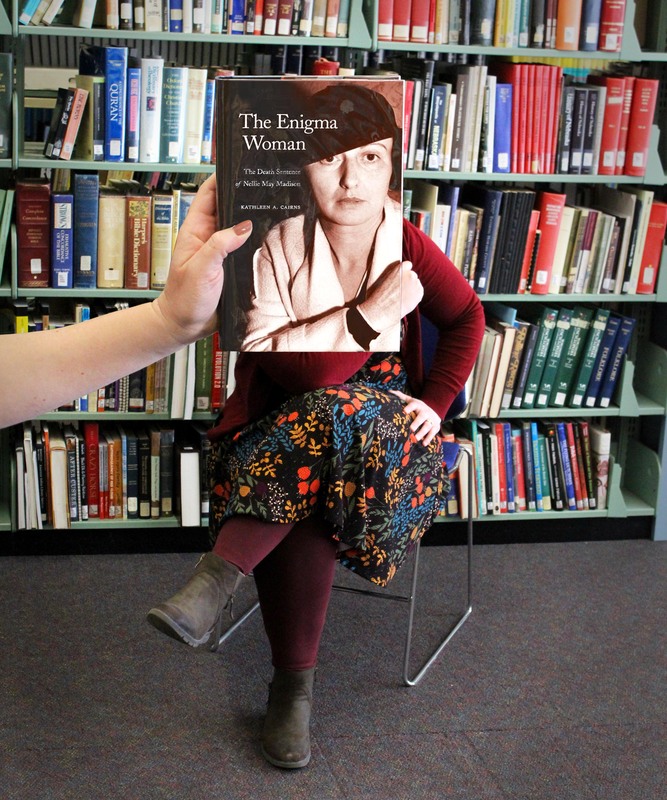 So this week’s #BookFace takes a look at Kathleen A. Cairns’ “The Enigma Woman: The Death Sentence of Nellie May Madison” (Bison Books, 2009). In this intriguing cultural history, Cairns tells the tale of Nellie May Madison, the first woman on Death Row in California. As part of our permanent collection it’s available for check out to anyone. Just ask our amazing Information Services staff! This title is published by the University of Nebraska Press imprint Bison Books, which we collect from for our state document program. This week’s #BookFace model is Talking Book & Braille Service’s new Reader’s Advisor, Justine Carmer! This new hire is also something of an enigma, although not the murderous kind (as far as we know), she’s been at the Commission for just a week. As a Reader’s Advisor, Justine will assist TBBS customers, recommend books and help catalog our TBBS collection. She’s a long-term vegetarian, who loves riding the 1970’s Peugeot (that’s a bike to the rest of us) that she built herself to work everyday. More importantly for our TBBS customers, she has a very soothing phone voice. Keep an eye out for her staff bio coming soon! We might even include a picture with her face.